Lately I've been trying to split long methods into several short ones. For example: I have a process_url() function which splits URLs into components and then assigns them to some objects via their methods. Instead of implementing all this in one function, I only prepare the URL for splitting in process_url(), and then pass it over to process_components() function, which then passes the components to assign_components() function. At first, this seemed to improve readability, because instead of huge 'God' methods and functions I had smaller ones with more descriptive names. However, looking through some code I've written that way, I've found that I now have no idea whether these smaller functions are called by any other functions or methods. Continuing previous example: someone looking at the code might think that process_components() functionality is abstracted into a function because it's called by various methods and functions, when in fact it's only called by process_url(). This seems somewhat wrong. The alternative is to still write long methods and functions, but indicate their sections with comments. Is the function-splitting technique I described wrong? What is the preferred way of managing large functions and methods? UPDATE: My main concern is that abstracting code into a function might imply that it could be called by multiple other functions. SEE ALSO: discussions on reddit at /r/programming (provides a different perspective rather than most of the answers here) and /r/readablecode. Testing code that does lots of things is difficult. Debugging code that does lots of things is difficult. The solution to both of these problems is to write code that doesn't do lots of things. Write each function so that it does one thing and only one thing. This makes them easy to test with a unit test (one doesn't need umpteen dozen unit tests). If, when describing the activity of the code to another programmer you use the word 'and', the method needs to be split into at least one more part. I have a process_url() function which splits URLs into components and then assigns them to some objects via their methods. This should be at least two methods. It is ok to wrap them in one publicly facing method, but the workings should be two different methods. Yes, splitting long functions is normal. This is a way of doing things that's encouraged by Robert C. Martin in his book Clean Code. Particularly, you should be choosing very descriptive names for your functions, as a form of self-documenting code. As people pointed, this improves readability. A person reading process_url() may see more clearly what is the general process to deal with URLs just by reading a few method names. The problem is that other people may think those functions are used by some other piece of the code, and if some of them need to be changed they may choose to preserve those functions and define new ones. This means some code becomes unreachable. modules in other languages may specify which functions are visible from the outside, etc. other languages like Prolog may require (or strongly suggest) the definition of a new predicate for every conditional jump. So in short, splitting in several functions is usually a good idea in terms of readability. It may not be really good if the functions are very short and this creates the goto effect or if the names are not really descriptive, in that case reading some code would require jumping among functions, which may be messy. About your concern about scope and usage of these functions, there are several ways to deal with it that are in general language dependent. Personally I prefer a one liner even if it is slightly complex rather than jumping and searching across several files of code, if it takes me more than three seconds to find some other part of code I may not even know what was I checking anyway. People who do not suffer from ADHD may prefer more explanatory names that they can remember, but in the end what you are always doing is balancing the complexity in the different levels of the code, lines, paragraphs, functions, files, modules, etc. but you force readers to jump back and forth. So there are no silver bullets here, but experience and balance. IMHO the best way to learn how to do this is reading a lot of code written by other people an analyzing why is it hard for you to read it and how to make it more readable. That would provide valuable experience. If you're just splitting it for the sake of splitting and calling them names like process_url_partN and so on, then NO, please don't. It just makes it harder to follow later when you or someone else needs to figure out what is going on. If you're pulling out methods with clear purposes that can be tested by themselves and makes sense on their own (even if nobody else are using them) then YES. For your particular purpose it seems you have two goals. Parse a URL and return a list of its components. Do something with those components. I'd write the first part separate and have it return a fairly general result that could be easily tested and potentially be reused later. Even better, I'd look for a built-in function that already does this in your language/framework and use that instead unless your parsing is super special. If it's super special I'd still write it as a separate method, but probably "bundle" it as a private/protected method in the class that handles the second (if you're writing object oriented code). The second part I'd write as its own component which uses the first for the URL parsing. It's incredibly important to use appropriate access identifiers on the smaller methods. It's frustrating to find a class littered with small public methods because then I totally lose confidence finding where/how the method is used throughout the application. I live in C#-land so we have public, private, protected, internal, and seeing those words shows me beyond a shadow of a doubt the scope of the method and where I must look for calls. If it's private, I know the method is used in only one class and I have full confidence when refactoring. In the Visual Studio world, having multiple solutions (.sln) exacerbates this anti-pattern because IDE/Resharper "Find Usages" helpers will not find usages outside of the open solution. If your programming language supports it, you might be able to define your "helper" functions within the scope of your process_url() function to get the readability benefits of separate functions. e.g. If your programming language doesn't support this, you might move foo() and bar() out of the scope of process_url() (so that it is visible to other functions/methods)--but consider this a "hack" you've put in place because your programming language doesn't support this feature. Whether to break a function into sub-functions will probably depend on whether there are meaningful/useful names for the parts and how large each of the functions are, among other considerations. Transform the logic into a small number of intention-revealing steps at the same level of detail. I believe the correct nesting of methods according to their "detail level" is important here. Much of the code we write doesn’t start out being simple. To make it simple, we must reflect on what isn’t simple about it and continually ask, “How could it be simpler?” We can often simplify code by considering a completely different solution. The refactorings in this chapter present different solutions for simplifying methods, state transitions, and tree structures. There, again, the warning not to mix different abstraction levels (emphasis mine). If you could design a class that is appropriate for these functions make them private. Put another way, with a suitable class definition you can expose the only what you need to expose. I'm sure this won't be the popular opinion, but it's perfectly ok. Locality of Reference can be a huge aid in making sure you and others understand the function (in this case I'm referring to the code and not to memory specifically). As with everything, it's a balance. You should be more concerned with anyone who tells you 'always' or 'never'. This function has up to 8 possible paths how your code can be executed, depending on how those condition evaluate. This means that you'll need 8 different tests just to test this part. Moreover, most likely some combinations will not be possible, and then you'll have to carefully analyze what are they (and be sure not to miss some that are possible) - a lot of work. It is very hard to reason about the code and its correctness. Since each of the if blocks and its condition can depend on some shared local variables, in order to know what's happening after them, everybody working with the code has to analyze all those code blocks and the 8 possible execution paths. It's very easy to make a mistake here and most likely somebody updating the code will miss something and introduce a bug. 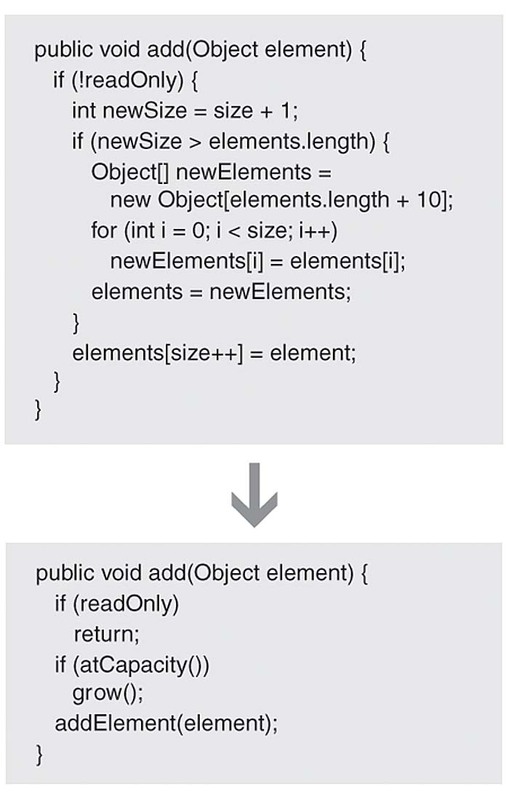 Easily test each of the helper functions, each of them has only two possible paths of execution. When examining myFun it is immediately obvious if result2 depends on result1 (just checking if the call to myHelper2(...) uses it to compute one of the arguments. (Assuming that the helpers don't use some global state.) It is also obvious how they're dependent, something that is much harder to understand in the previous case. Moreover, after the three calls, it's also clear how the state of the computation looks - it's captured just in result1, result2 and result3 - no need to check if/what other local variables have been modified. The more concrete responsability a method has, more easy to test, read and maintain will be the code. Although no other calls them. If in the future, you need to use this functionality from other places, you can then easy extract those methods. I don't see why anyone would think that these would be called by some other process, and it is perfectly clear what they are for. Not the answer you're looking for? Browse other questions tagged readability functions methods or ask your own question. When is it appropriate to make a separate function when there will only ever be a single call to said function? Refactoring into lots of methods - is this considered clean or not? Should I extract specific functionality into a function and why? Should simple tasks be divided into separate functions? Are private methods with a single reference bad style? How do you decide what code to put into a function? Is splitting up a function into several inner functions an anti-pattern? Why do we add instance methods to classes? For use once only functions extracted from a longer function, should the name be xxx1(),xxx2,… or relate to its task? Does separating chunks of “similar” code into separate functions really improve maintainability? How should I call splitted functions? centralize them? or call it one next to one?